The preferred route for one of the most challenging sections of the A9 to be dualled will be revealed next month. Roads bosses will set out their plans for the Slochd to Dalraddy section at public exhibitions on March 2 and 3. The preferred option for dualling a further section of the A9 between Kincraig and Crubenmore will also be set out a week later at further public events. The 15-mile stretch between Slochd and Dalraddy is seen as one of the most technically challenging in the entire £3billion dualling project. The Inverness to Perth road is tightly constrained at Slochd summit by rockfaces and the Highland Mainline railway track. Further south on the section major junctions are required to service the villages of Carrbridge and Aviemore. 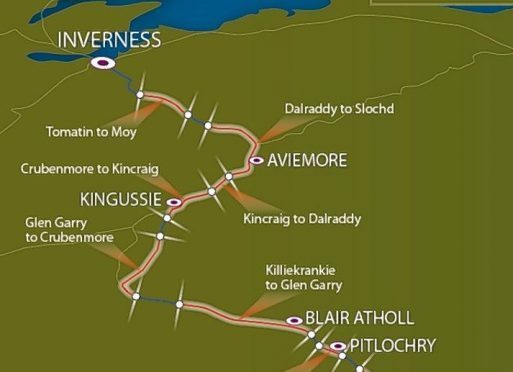 Meanwhile, the 11-mile section between Kincraig and Crubenmore passes the villages of Kingussie and Newtonmore – with one of the main challenges posed by the crossing of the River Spey and its extensive floodplain. The two schemes sits either side of the Kincraig to Dalraddy dualling section which is currently under construction. Exhibitions for Dalraddy to Slochd will be held at Aviemore Community Centre on Thursday, March 2 between 12pm and 8pm – and then Carrbridge Village Hall at the same times the following day. The preferred option for Crubenmore to Kincraig will be revealed at an event between 12pm and 8pm at Newtonmore Village Hall on Wednesday, March 8. A second event will be held the following day at Talla Nan Ros in Kingussie between 11am and 7pm.